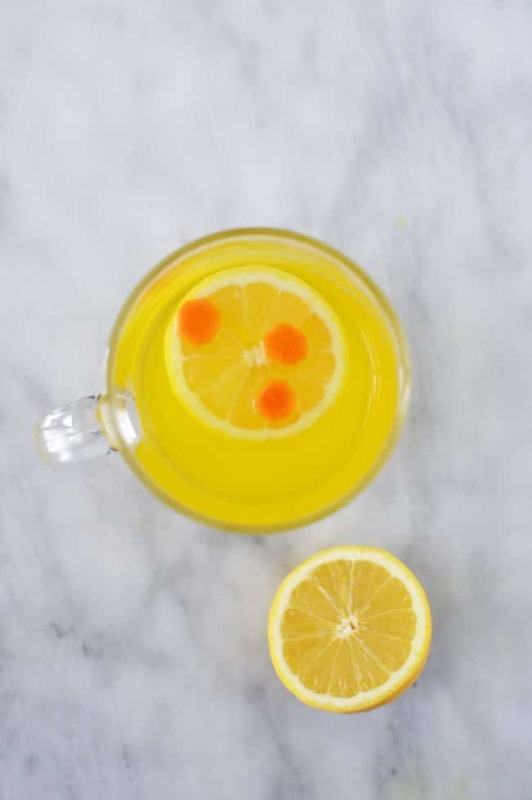 You’ve probably heard about the benefits of drinking warm lemon water every day, but I’m going to help you level-up your daily drinking rituals with this incredibly powerful detox turmeric tea with lemon and ginger. This warm combo of natural, detoxifying and immune-boosting ingredients will help your body remove toxins, soothe digestive issues and give you a major jolt of disease-fighting antioxidants. Sounds pretty good, right? It is! If you’re a regular Dear Crissy reader you know that I’ve been working on a whole series of turmeric recipes. If you’re interested, you can check out my golden paste, golden milk, turmeric latte and cold and flu fighting turmeric gummies posts for more great ideas to incorporate this useful little spice into your life. Here’s why this detox turmeric tea is worth trying. Lemon: this powerful little fruit is known to flush the body of toxins, reduce bodily inflammation and aid in digestion. It’s also anti-bacterial and because it’s loaded with vitamin C it’s great to fight colds and other infections. 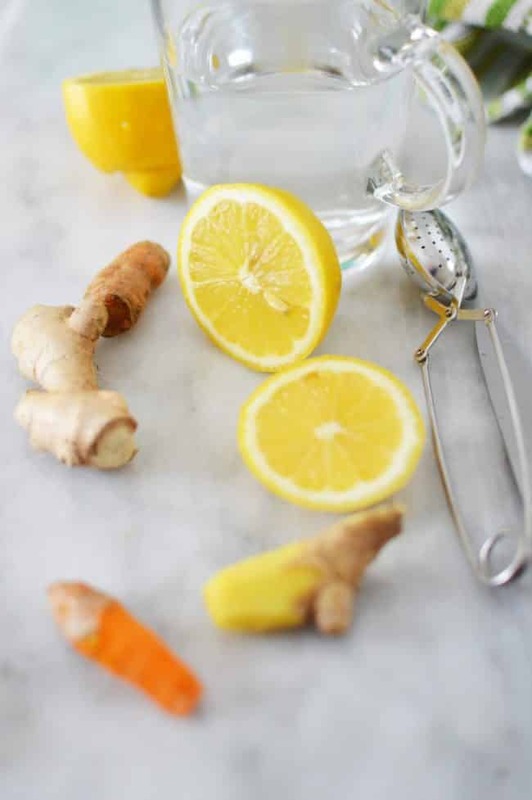 There are so many benefits to drinking even just lemon water, so added to this detox turmeric tea that lemon is really going a long way for your health and wellness! Ginger: you guessed it, ginger is also a great anti-inflammatory agent and immune system booster. If you’ve ever been pregnant (or on a boat), you’ve probably also heard that ginger is great at fighting nausea. It’s also wonderful in aiding digestion and reducing joint and muscle pain. Turmeric: I’ve written extensively about the wonders of turmeric here on my blog. Turmeric is known for it’s powerful anti-inflammatory properties and has been used by people all over the world for thousands of years to treat conditions like bronchitis, laryngitis, diabetes and arthritis. You can even use turmeric on your skin, just look at my wonderful turmeric and honey face mask for example! Honey: This additive to your detox turmeric tea is certainly optional, but it offers a great way to sweeten-up your turmeric tea with an ingredient that is its own powerhouse for wellness! honey is anti-bacterial and anti-fungal and is a potent anti-inflammatory and wound healing agent. Honey is also great for soothing sore throats and coughs making this turmeric a great choice when you’re feeling a cold coming on. Of course, the strength of your detox turmeric tea will depend on how long you let it steep, but don’t forget that you can add some honey to sweeten the flavor at the end. 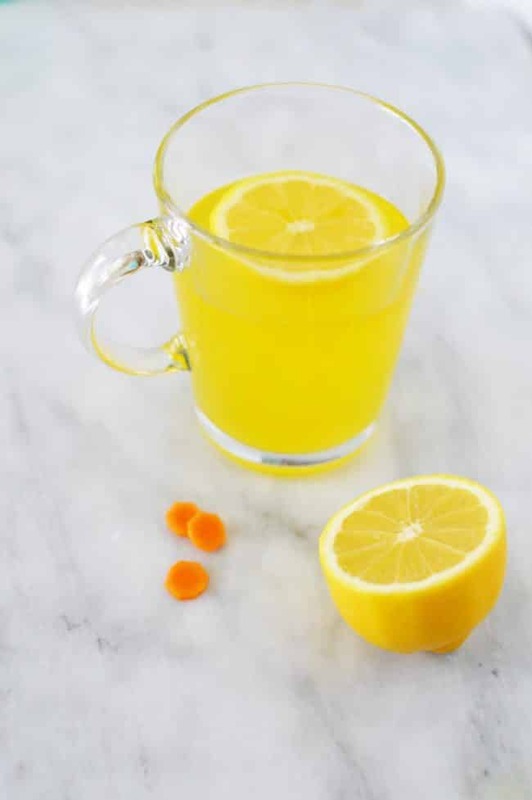 I’m generally a really big fan of warm drinks, especially during the winter, and I love that this detox turmeric tea also doubles as a cold and flu buster. Having just recovered from a nasty stomach virus last week I’m doing everything I can to bolster my immune system. I’ve really noticed that my digestion has improved since I started enjoying this drink 2-3 times a week, which is a really great thing since that’s an area of constant struggle for me. 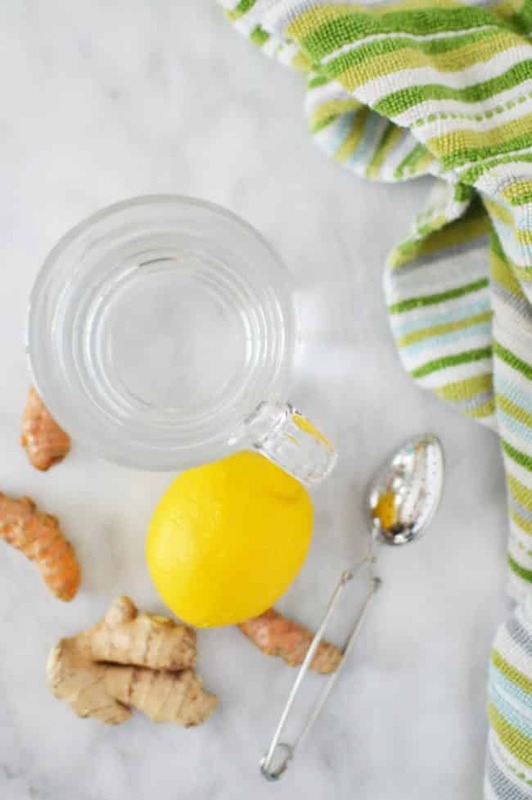 Be sure to grab this super-easy detox turmeric tea recipe below and pin this post to your favorite health and wellness Pinterest boards! Remove the peel on the turmeric and ginger, some find this easier to do with the end of a spoon then a traditional peeler. You may then either cut slices of ginger and turmeric and add to the hot water along with the lemon or you can grate them and put them in a tea infuser. 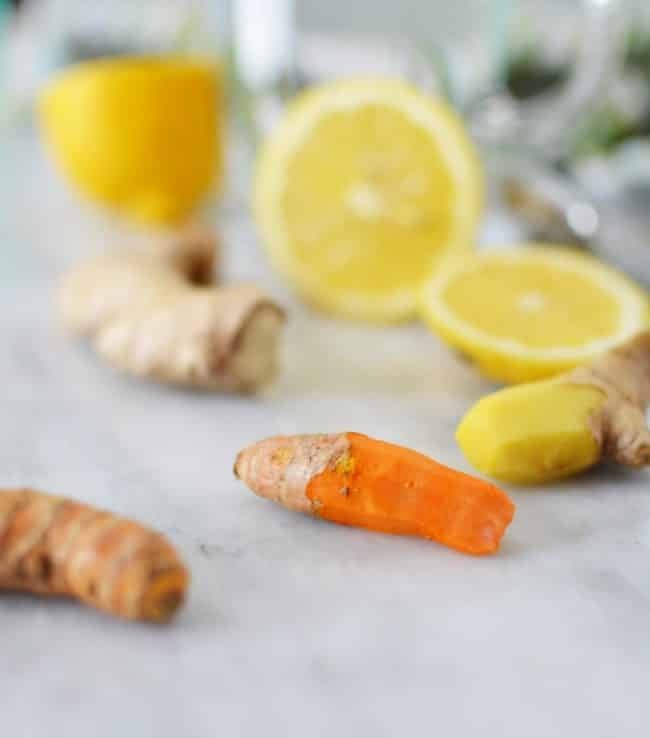 I like the second option, even though it sometimes will result in bits of ginger and turmeric floating in your tea, it also opens up the roots a bit more to release their benefits. Allow to steep for 5 to 7 minutes before enjoying. Turmeric is the latest and greatest thing for inflammation. I will have to try this tea. Thanks for sharing. 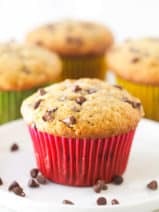 Is there something I can substitute for the coconut milk? I can’t tolerate it but really want to try this. Thanks! I heard turmeric is really good for you. I need to try this sometime. Thanks for sharing at the Inspiration Spotlight party. Pinned & shared. 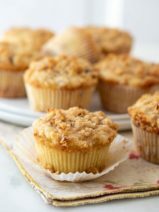 I love my tea time and will have to try your recipe, I am pinning it! Hope you are having a fantastic week and thanks so much for sharing with us at Full Plate Thursday! Hi. 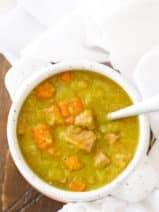 I love your recipes with turmeric. My Father has Liver Cancer and we have been dosing him with turmeric in all sorts of ways. I love this way with putting it in the lemon water. Great Idea and thanks so much. I’m definately going to be following you. Turmeric Gummies…who knew? I love all the health benefits from turmeric and I can hardly wait to try your tea this weekend! Love all the health benefits of this. Looks delicious as well. I loooooove tea ! 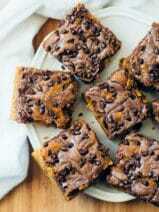 Will try this recipe for sure , thank you for sharing ! 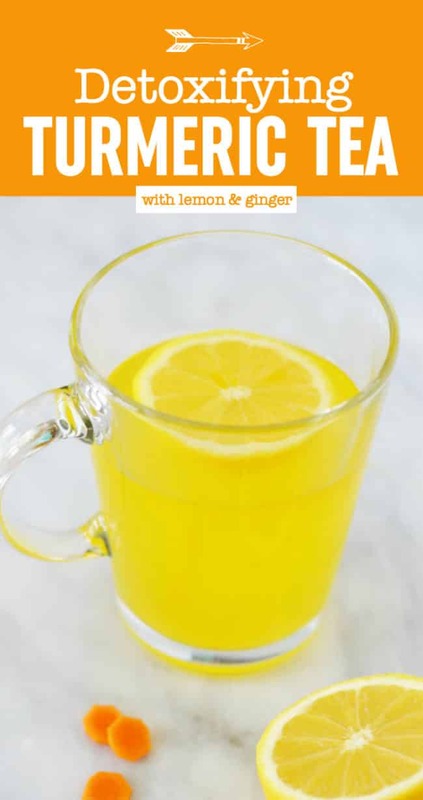 I have been enjoying lemon ginger tea recently and I LOVE that you have added turmeric to this recipe. 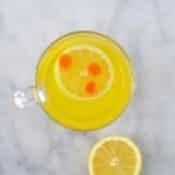 I always seem to struggle finding ways to incorporate turmeric, you links are great as well! Pinned! I found you at What’s Cookin Wednesday! Turmeric is hard to find around here, but now I want to look for it again to keep on hand. 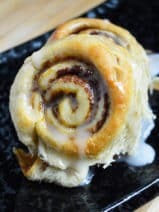 This right here is my goal for tomorrow, make and drink! Same question as Amar, can I use powder of everything? Not sure about results because I haven’t tried it, but you should give it a whirl. Let me know how it turns out! Regarding your Detox Turmeric Tea recipe listed above, can I use ground turmeric powder in place of turmeric root? I so, how much turmeric powder should I add for the 8 ounces of hot water. Would a quarter teaspoon be OK? Thanks. Hi Amar, I haven’t tried it but I’m sure it would be fine. I’d say a quarter teaspoon would be fine. Let me know how it worked out if you try it!